Billboard chart-topping duo TWIZTID are gearing up to embark on their “Back To Hell: The Darkness Tour”, featuring support from KUNG FU VAMPIRE and special guests DAVEY SUICIDE, THE DAMN DIRTY APES and KISSING CANDICE. In anticipation of the run, TWIZTID have just revealed the brand new music video for the track “Boogieman”. Laden with TWIZTID’s signature horror-imagery style, the “Boogieman” music video was filmed in North Hollywood, CA at the California Institute of Abnormalarts and stars horror film legends Reggie Bannister (Phantasm series) as the puppet-master and Tyler Mane (Halloween, X-Men) as Boogieman. Make-up artistry for the video was provided by Greg Lightner of Syfy’s Face Off fame. “Boogieman” was directed and written/conceptualized by Roy Knyrim of Los Angeles. Check out the new video right HERE. 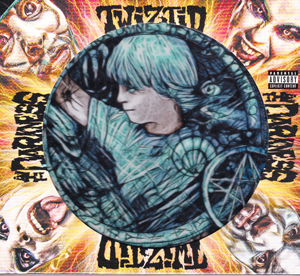 “Boogieman” appears on TWIZTID’s new album The Darkness, which debuted on the Billboard Top 200 charts at #29, marking their 11th album debut on the chart. The Darkness marks the group’s first Billboard debut since the launch of their new independent label, Majik Ninja Entertainment. Order your copy of The Darkness now via www.Twiztid-Shop.com. As mentioned above, TWIZTID will head out on the “Back To Hell: The Darkness Tour” this May after knocking out their annual 4/20 performance in their hometown of Pontiac, MI.See below for all currently confirmed tour dates.